Five Finger Death Punch News: Zoltan Bathory: "Two or three of the best songs we've ever written are on upcoming record"
Zoltan Bathory: "Two or three of the best songs we've ever written are on upcoming record"
During a question-and-answer session with fans at the Bandit Rock radio station in Stockholm, Sweden, Zoltan Bathory spoke about the band's upcoming album, that will be out early next year. 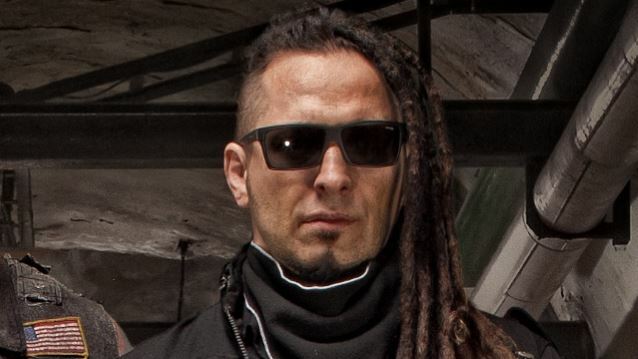 "We are Five Finger Death Punch, so it's gonna sound like Five Finger Death Punch," Zoltan said, before adding that the new disc would contain "no jazz fusion. It's a really good record; I think it's one of our best, if not the best," he said. "At this point, we're keeping our sound, but it's about songwriting and getting better and better songs," he explained. "We had a little bit of wrestling match with our record label, and we settled that issue," Zoltan said. "And we had a record that we recorded maybe a year ago. To be completely correct, we finished it a year ago — last December, something like that — and we had a little, as I said, wrestling match, a legal one, but now it's settled. And what it means to us is that we're putting out this greatest-hits record and a record that we recorded then. Since that, we recorded a couple of new songs, so that's gonna be added to that, but it's all new material that you guys, obviously, didn't hear before. So because the greatest hits also has two songs, we have about… in the next six or seven months, you guys are gonna hear about 17, 18 songs that are coming out, between all the records." Zoltan said that Five Finger Death Punch's upcoming album will contain "probably about 12 new songs and a few bonus tracks on the deluxe edition. But I'm really proud of it. Probably a couple… I would say maybe two or three of the best songs we've ever written are on this new record," he said.